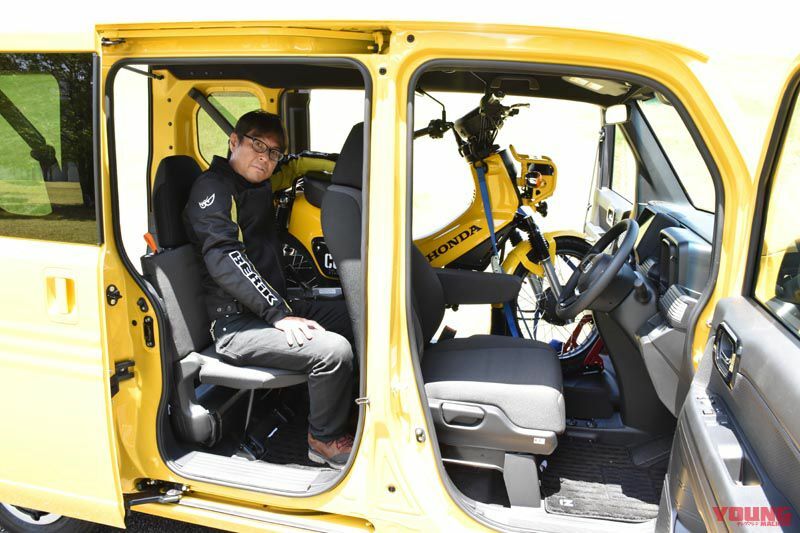 From 13th July 2018 the Honda N-BOX light passenger vehicle went on sale with a cargo spec, the N-VAN. When one says van, the typical image is of a basic white vehicle that is used for work, but the N-VAN works well for business use while incorporating various devices for general hobbies. Of course, being Honda they have also made it compatible to load a bike. The existing Acty van will be replaced by the new N-VAN light motor vehicle that went on sale on 13th July. The N-VAN is a brand new model that has been developed with the aim of making full practical use of the existing N-BOX platform, while meeting the demands of a lightweight van that ensures a wide amount of space and an efficient loading operation. 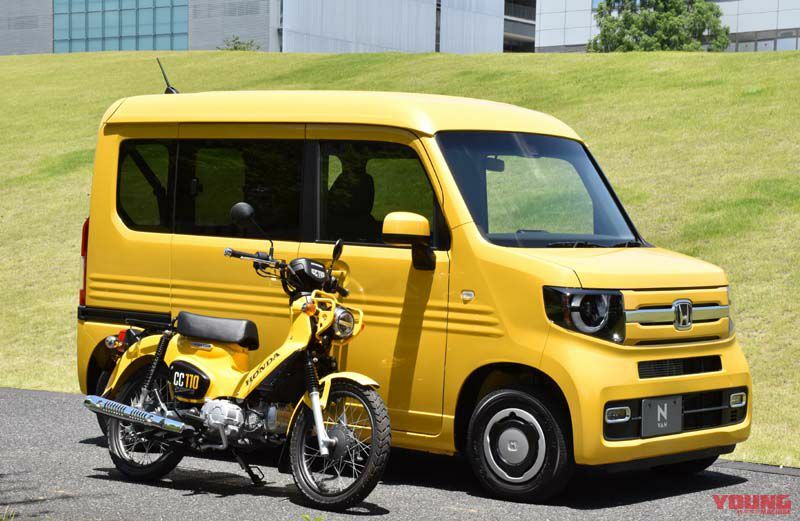 Because it is based on the N-BOX passenger vehicle it is very quiet, and due to the central fuel tank layout the floor is low and ground clearance is kept down, along with offering a tall loading space for luggage. These are all important elements when it comes to transporting a bike. Also, we actually got the chance to try out loading some bikes like the Cross Cub 110 and Monkey 125. As you can see in the pictures it went in without any hesitation. 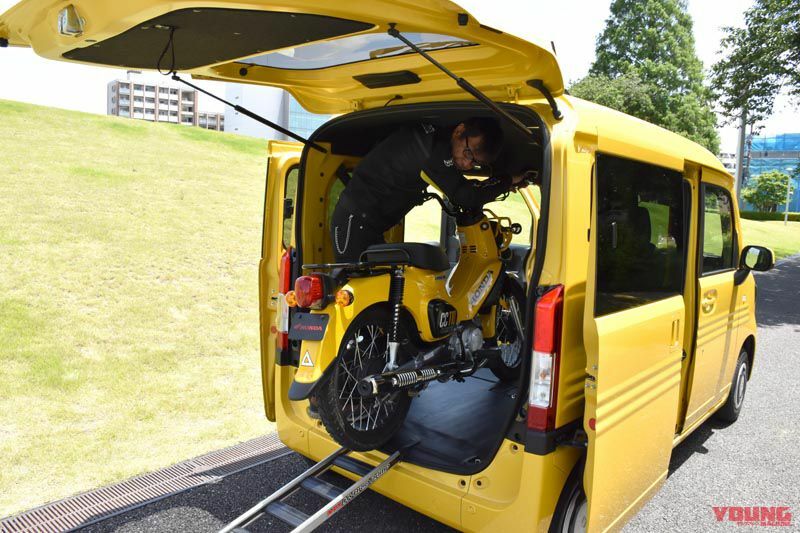 By folding down the passenger seat a maximum space of 2635mm (Cool type 2560mm) in length can be made, so based on this it makes it feasible that big bikes can be loaded, too. 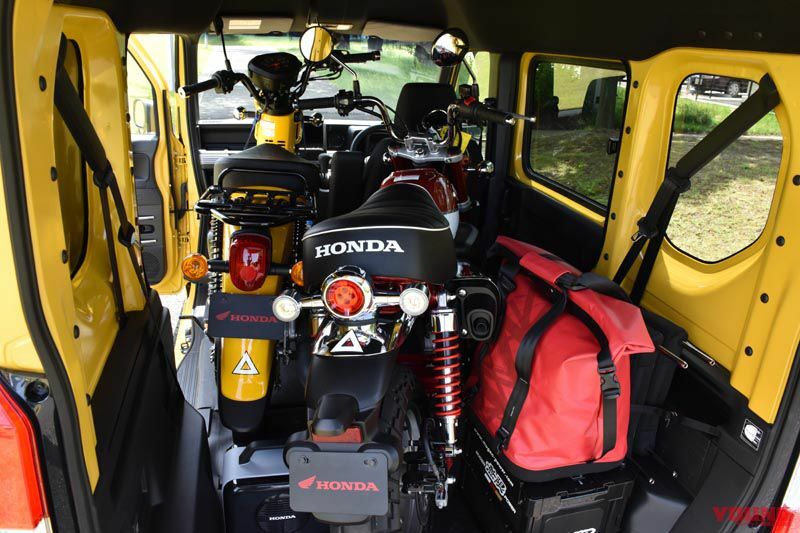 Loading tests of Honda bikes were carried out while the N-VAN was in development, and it seems as though most of the range can be loaded. Because of height restrictions and its maximum weight capacity of 350kg it’s no surprise that such bikes as the Africa Twin and Goldwing cannot be loaded, but the likes of the CBR1000R and CRF250 Rally have been loaded before, which shows it has a lot of potential as a bike transporter. 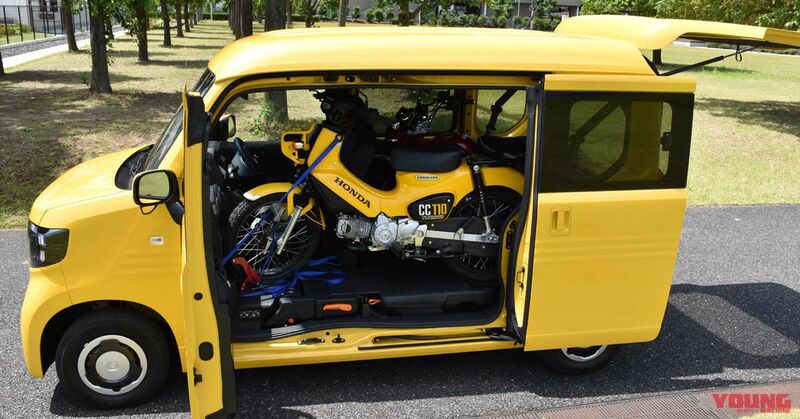 (Honda N-VAN+Style Fun 2018 model. Price: $13,895 – $15,965) Other than the standard white body N-VAN, there is the “Style” version that is intended for general purpose use. There are also two varieties of roof height, the “Fun” high roof version and the “Cool” low roof version. Not only can you choose to have the power train in MT, CVT, 2WD or 4WD, it is also possible to have a turbo fitted (only the CVT, not a preference setting as standard). Because it is a lightweight vehicle, it means that even if it has a load weight of level four (Japanese licensing system) then it only needs to have a vehicle inspection once every two years (in Japan), and vehicle tax for personal use is 5000 yen ($45) per year, so the running costs are attractive. Here is the +Style Fun with a Cross Cub 110 loaded. Even if the passenger seat is folded down, the rear seats are separated so it is possible to seat two passengers. So you can also head out touring with two people. We made up a challenge to see how much we could pack in once the rear seats were both folded down, too. Well, it is incredible to see how we managed to load two bikes plus extra baggage, and were still able to close the tailgate properly. There are a total of eight tie-down hooks located in the vehicle as standard, so there should be no issues in that regard. 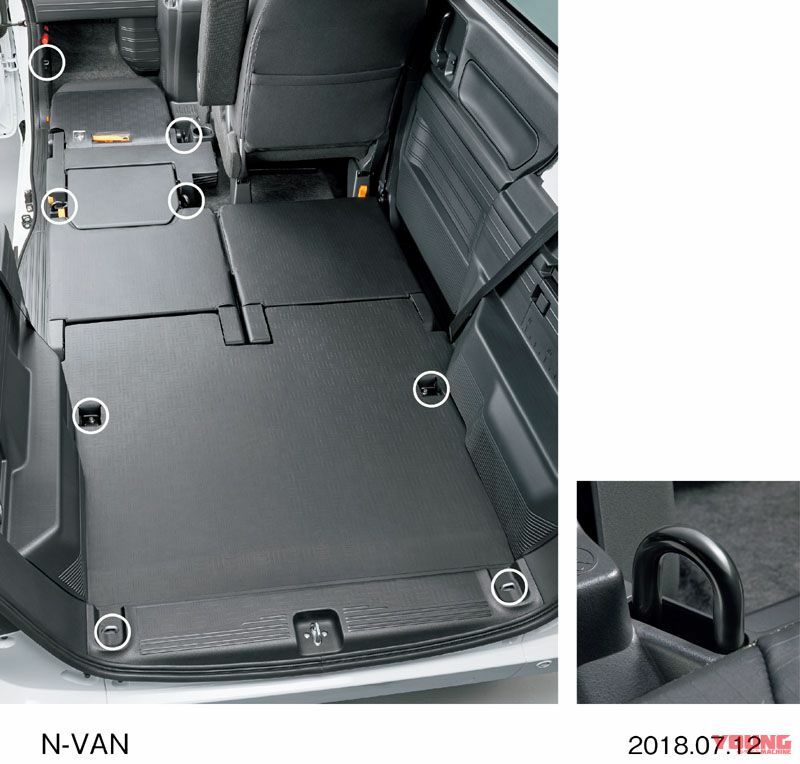 Once could say that a big characteristic of the the N-VAN is the high level of freedom within the seating arrangement. While it maintains a normal number of seats for four people, the left and right rear seats can be folded and stowed away independently. In addition to the front passenger seat that can be folded down, the left-hand side floor area can also be made totally flat. Due to this it has a lengthy 2.6 metres of loading space, so despite this being a light vehicle frame it is great as a bike transporter. Also, there are four tie-down hooks positioned around the front left-hand side, and four hooks positioned in the corners at the rear, so fixing down a bike in place is no problem. Use a wheel clamp on the front tyre for peace of mind. (upper left) Boot area space when all four seats are up. 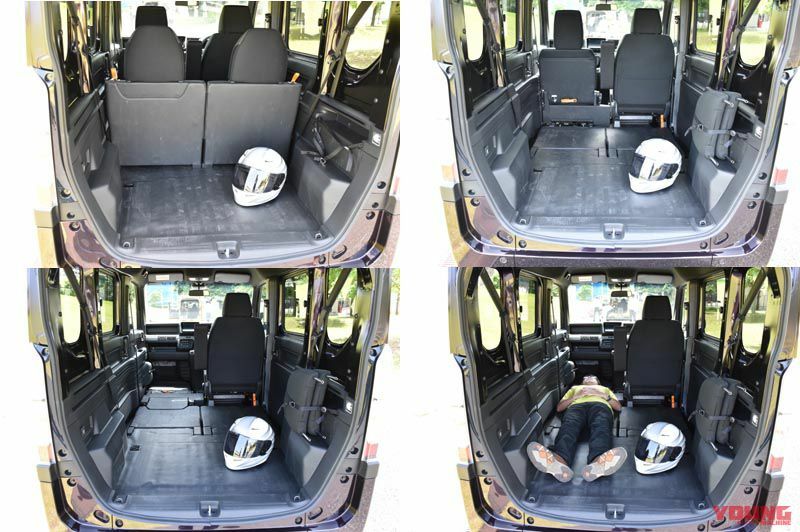 (upper right) Boot area space when the two rear seats are down. Looks like you could fit in things like a bicycle. (lower section) Boot area space when all three passenger seats are down. The left area has a length of around 2.6 meters (photo is of the Cool version which is 2560m), so you can take a good rest like this when you’re feeling tired! There are a total of eight tie-down hooks arranged that have the level of strength to support fixing motorbikes down properly. 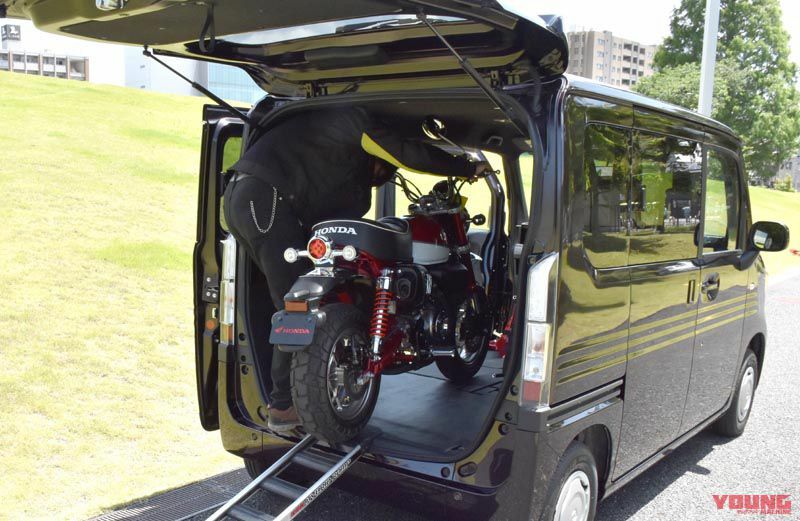 In the case that you use the van as a bike transporter, it is no surprise that the high roof “Fun” version is more advantageous. The tailgate opening height is maintained at 1300mm. Even so, the low roof “Cool” version can also load a bike too of course. The tailgate opening is 100mm lower than the “Fun” version at 1200mm. The price of the N-VAN+Style cool gets the same setup as the “Fun” version.